fpj-photo-challenge – Page 43 – Dutch goes the Photo! Great to see that this week’s topic didn’t have too many people sitting on the fence (there was an exception 🙂 ). The usage of the theme of fences was definitely creative and showed some very interesting views! Thanks to all of you who participated and provided encouragement! The fence that I showed in this image, is used to drive sheep around, or, if there’s a second one, to drive the sheep between during herding tests. Sheep herding is an interesting sport, as it is all about utilizing the dog’s instincts to project power and control the sheep. Miriam of the Out an’ About blog, started us with a wonderful silhouette sitting on a fence, and showed some great fence images! Debbie, whose blog is Forgiving Journal, wrote a wonderful post about getting off the fence. Kim brought a variety of great fence images on his blog Do You See What I See? ; the multiple uses of a fence between sea gulls, humans and ants were quite entertaining! A new participant this week came from the Daily Blabber, which is a great photography blog! Her photo made me want to be on that beach! Nadia’s entry this week on Becoming Roots showed us a gorgeous Winter landscape with a fence laden with snow. Brigid’s post on Watching the Daisies provided thoughts on pastures and gorgeous landscapes with fences. Sonya, who writes Middleton Road, posted a stunning image of fencing with a mailbox and pasture. Marie writes the New 3 R’s: Retire, Recharge, Reconnect, and posted a great image of a toque macaque who prefers not to be fenced in. Steve’s post in Meandering Maverick provided a study of chainlink fence with various views and configurations including curvature. Nikki’s blog is A Kinder Way, in which she created a wonderful post about the fence she likes best…no spoiler alert, so go check it out! The turn-out this week was excellent and I was veryimpressed with the quality of all the entries! It was a lot of fun to read and view each of your creations. Now to start preparing for Tuesday’s new topic… Let’s see, if I can up with something inspiring. Thanks to everyone who checked out and participated in last week’s challenge of Vegetables. The turn-out was great and the entries were interesting and innovative! It’s hard to believe that we’re ready to hit the 10th iteration of this challenge! This week, I’m turning to something that we see everwhere around the world, which can really tell us something about its purpose: Fence. Ranging from the proverbial, and sometimes literal, white picket fence to mark our garden boundary to electric fence to keep cattle contained and decorative wrought iron fence around a churchyard. What caught my interest with this fence were the texture contrast between snow and fence, as well as the shadows and the fact that it was standing all alone. For extra credit, can you tell me the function of this fence? This image was captured using an iPhone 4S with the standard Camera app. The challenge was to not just present an image of vegetables, but to do something creative, keeping an eye on composition, colors, lines and all the pieces that make for a great photo. I’m happy to say that the entries were worthy!! Marie writes the New 3 R’s: Retire, Recharge, Reconnect, an wonderful blog that is an inspiration to all; her post shows us asparagus in Venice, Italy! Miriam of the Out an’ About blog, showed us the current state of her vegetable garden and some shots preceding the harvest! Debbie, whose blog is Forgiving Journal, showed the connection between touching the soil and forgiveness using a friend’s vegetable garden. Nikki, who writes A Kinder Way, took us into the produce section at her local grocery store to show us her love for veggies. Kim just posted another great shot on his blog Do You See What I See?, highlighting the beauty of vegetables exquisitely! These were all fantastic entries and I enjoyed reading them very much; hope that you looked at each other’s posts and enjoyed them. Orange you glad about carrots? Last week’s challenge was of a more abstract nature in asking you to share your visual concept of the Human Spirit. This week, in the tenth installment of TPC, I am going back to a more concrete concept in calling on you to share your best image(s) of Vegetables. Of course, you may think that this will be an easy challenge, and you can make it that by taking a quick Instagram photo, but I’m counting on you to do much more than that! In this challenge, I’m looking forward to seeing some of your creativity at work in putting together an image that is worthy of display. Creativity in portraying your vegetables might involve color choices, composition, light angle and whatever else you may think to include! A simple example is this organic carrots image that I did a couple of years ago. This image is a simple approach to setting up a shot using a bit of lines to lead the eye, color repetition (that’s just orange paper) and a cutting board to provide contrast. 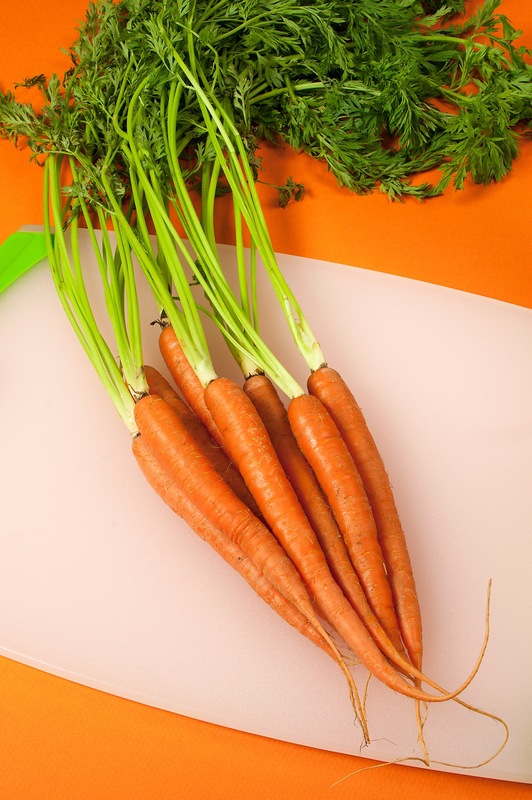 I used reasonably soft light to eliminate any harsh shadows, which would take away from the carrots. I am confident that there is going to be some serious creativity this week! And don’t forget to invite your friends to the party and remember to have fun!! This image was captured using a Canon EOS 5D Mk III using an EF 24-105mm f/4L lens. Exposure settings were 1/100 second at f/8 at 1o0 ISO. This week’s entries were very impressive, which is even more impressive, as this week’s challenge was difficult, as I asked people to express an abstract concept, the Human Spirit. I was inspired by recent events to select the human spirit, as it is what will pull us through and, most importantly, pull together, as humanity should and will prevail. A warm thanks to all who participated, as the response was heartwarming! Steve, who writes Meandering Maverick, showed us a great memorial for local Police, Fire and EMS, who often put their lives on the line to help others. Miriam of the Out an’ About blog, documented the incredible drive and determination of the people of Marysville, a village that was wiped out by bushfiers only to make a strong comeback! Nadia, who writes blog Becoming Roots, shows us that many things, even little ones, help us maintain and sometimes rebuild our human spirit. Debbie, whose blog is Forgiving Journal, provided a truly uplifting report of a wonderful person giving hugs against LGBTQ violence! Nikki, who writes A Kinder Way, provided a report on her Life is Good shirt that was released to support victims recovering from the Boston Marathon bombing. Kim may have been late, but his entry on Do You See What I See?, serves as a great reminder that we should not take our planet for granted and that it takes human spirit to stand up for the environment! A late entry by Bikurgurl, whose Just a gurl in the world tagline belies the depth of her blog (great writing! ), touched on the little details of the human spirit! This is already the ninth installment of the Tuesday Photo Challenge! Participation in last week’s challenge with the them of Lines was rock solid with some amazing photography and even haikus to join in with the fun! While I was thinking about what to select for this week’s theme, I decided to go in yet another different direction, partially to offset the horrific event of this past weekend in Orlando. I want to go for something that is positive in humanity in that I am challenging you to capture the Human Spirit. The Human Spirit is around us everywhere in lots of positive expressions, so go out there and capture some of that positivity and share it with the world! My image for this week comes from an event that I have been lucky enough to photograph over the past couple of years; the Massachusetts Down Syndrome Congress‘s Buddy Walk is a hugely successful fund raiser for them, but it’s something even bigger. This event is a true celebration of the human spirit, as it is a combination of acceptance, inclusion, perseverance and pure joy that leaves me uplifted every year that I am lucky enough to photograph the walk. I fully expect to see some great examples of the human spirit in this week’s photography, and hope that all of you celebrate this challenge! This image was captured using a Canon EOS 5D Mk III using an EF 24-105mm f/4L lens. Exposure settings were 1/500 second at f/8 at 640 ISO. This image is also a nod to the Daily Post Weekly Photo Challenge – Pure, as nothing is more pure than the joy of a child.